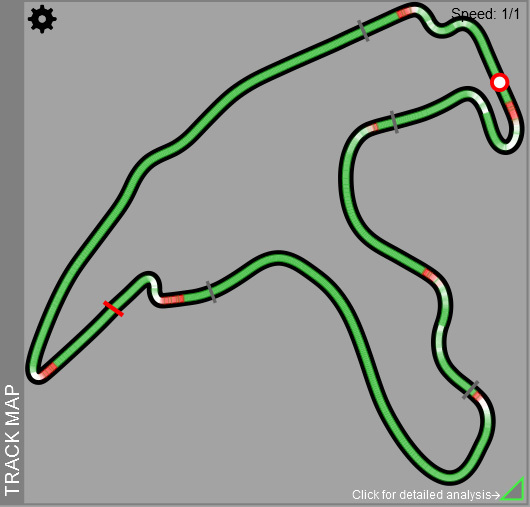 The Z1 Analyzer displays the track map for the circuit. This is a very important part of the analysis as it shows you where you are on track, as well as speeds, braking/throttle application and elevation changes. 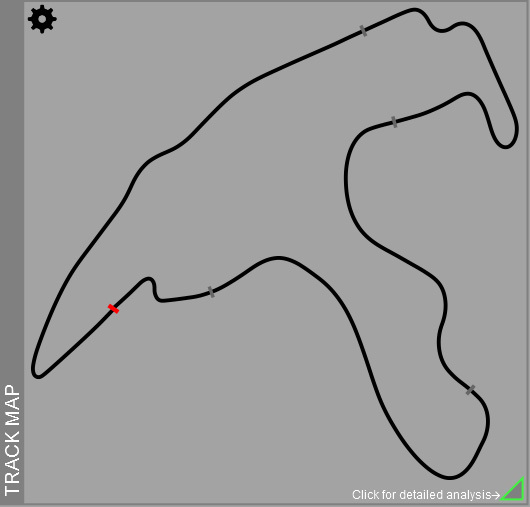 Your car's positions is shown as a white dot with a red outline. 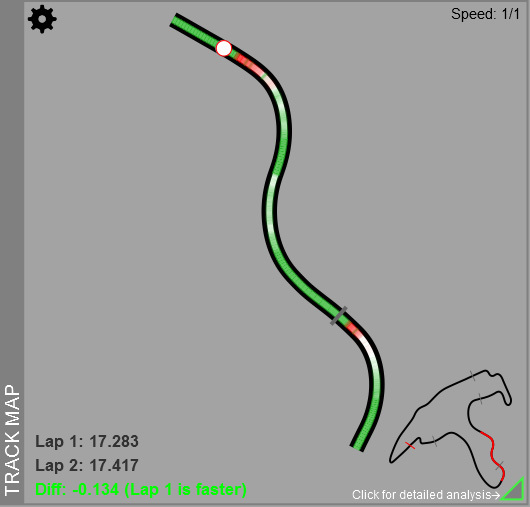 As you progress around the lap either by playing back the lap or by clicking on a trace, your car's position will automatically update. The default display shows the track map as a 2 dimensional overhead layout. Applying the throttle/brake overlay displays your throttle and brake application on top of the track. This allows you to easily see how much throttle and brake you are using at any point of the track. The darker the color, the more throttle or brake you are using. 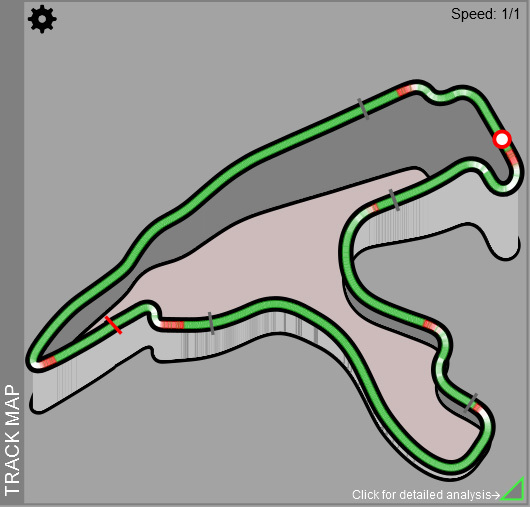 The 3D track map option shows all the elevation changes that occur throughout the lap. This can help you determine where you are being hewlped or hindered by the track as you approach brake zones, or go through turns. 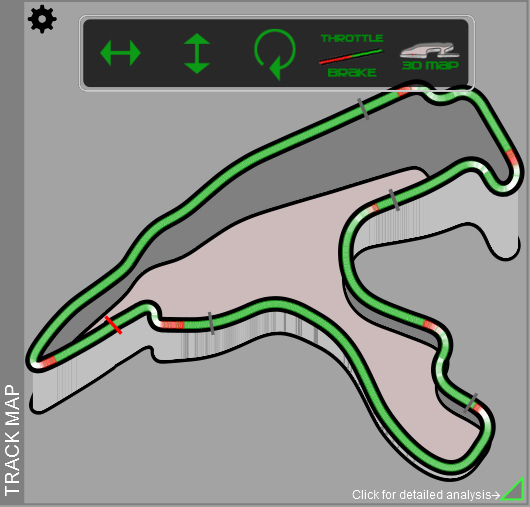 Whenever you zoom in on a trace, the track map will also zoom in to the same level of detail. A small track map will be displayed at the lower right, with the zoomed portion highlighted in red so you always know where you are on track. To manipulate the track map, click the gear icon at the top left. You can then choose options for rotating the map, or enableing the overlays or switching between two and three dimensions.